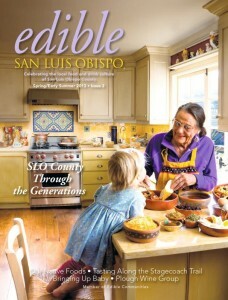 Author’s note: This article is reposted with permission from Edible SLO Magazine and the entire issue is available to read here. Looking at San Luis Obispo County wine country, it’s difficult to believe there was ever a time when wine didn’t rule the landscape – or the economy. But industry heavyweights like Gary Eberle, Justin Baldwin, and John Niven were once nascent winemakers risking all they had on SLO County’s potential. Whenever we crack open a bottle from a local producer, we can thank our forebears for taking that chance. Most members of the group know each other from student days at Cal Poly. As they individually graduated and started day jobs– some in the vineyard, some in the lab, others in sales –evenings and weekends were spent making miniscule amounts of their own wine. Eventually, those side projects grew into small yet bona fide brands. The result is Plough Wine Group, which focuses on California distribution of the group’s wines to retail and restaurants. Every wine produced by the group is made by its members. Explains Jones, “It’s our own labor and time put into everything. When any member shares their wines, they can say that it was made by their own two hands.” That means plenty of creative control for the winemakers, and lots of outrageously good, distinctive wine for consumers. While creative control may not seem all that unusual, the truth is large wine companies in today’s wine business are dominated by corporate operations, while boutiques tend to be trophy projects. “It is a tough business for the little guy, but the collective model has helped us to be successful and make a career out of it,” Jones says. 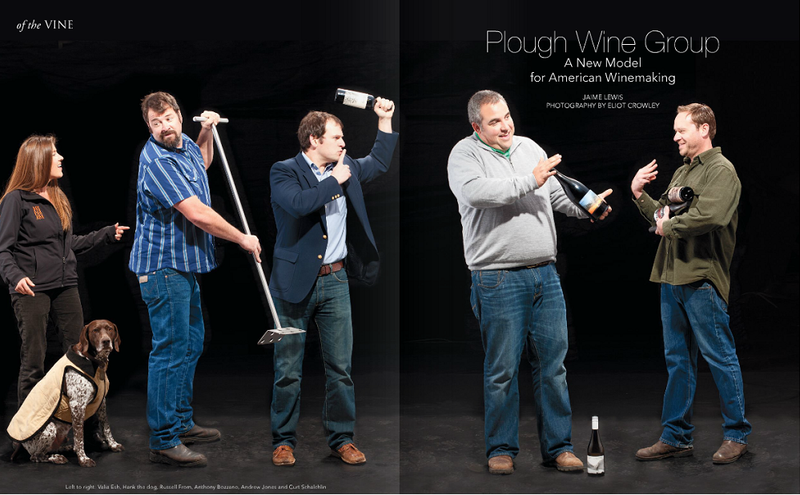 Each brand represented in Plough Wine Group is an entity all its own – one very different from the next. Despite the distinctions between brands, however, a common thread is the clarity with which each wine reflects the personality of its maker. So far, that sort of authenticity has served the collective very well. In May of 2012, the group took its wines on the road to pour for wholesale and retail clientele in the Bay Area. Renting a house in San Francisco’s North Beach neighborhood for one week, the group made sales calls and hosted tasting events in the area to overwhelming acclaim. And although Plough hasn’t yet scheduled events in southern California, as a group, their sales volume has increased 40% on average after just 24 months of working as a collective. Perhaps, as Plough Wine Group’s website states, the collective really is “the new model for American winemaking.” If so, we can expect that Plough’s members are putting San Luis Obispo County wine on the map yet again. Thanks to their ingenuity and collaboration, the next sip you savor could be as personal and one-of-a-kind as your own fingerprint. Brothers Lino and Anthony are true sons of the land, growing up farming in Northern California, and now making a living working on Central Coast vineyards. Using legendary sources, they produce wines that respect the “Old-World” but showcase the place they call home. Valia’s lust for life that has taken her around the world, only to lead her to the Central Coast. Here, she produces soulful and eclectic Mediterranean-styled blends inspired by the wines she has met and loved along the way. Tall tales, Wrangler jeans and bold wines are what Russell P. From is best known for. Working with fruit from some of California’s most sought-after vineyards, Herman Story has quickly built a cult following for lovers of larger-than-life Rhône-style wines. Visit the Herman Story tasting room at 1227 Paso Robles St in Paso Robles. From his day job as a traveling grape vine salesman, Andrew knows that each vineyard has a voice of its own. Andrew honors his source sites with a minimalist approach in the cellar, resulting in small batches of diverse wines that tell more about where they’re from than who made them. From East LA, Curt moved to the Central Coast and worked as a cellar rat for several years before ever releasing his first wine. Now an established winemaking force, Curt makes wines that garner scores and grace magazines. Visit the Sans Liege tasting room at 870 Price Street in Pismo Beach.